Sat., July 7, 2012, 4:55 a.m.
KALISPELL, Mont. 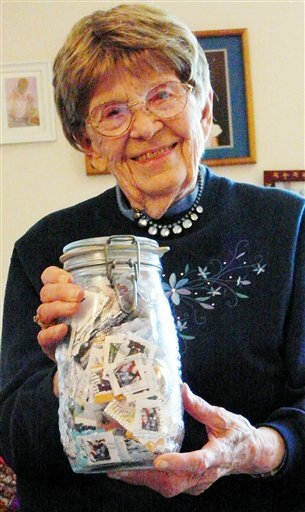 (AP) — At 91, Polly Nikolaisen has found a way to help stamp out tuberculosis and help disabled children by working with canceled postage stamps while sitting in her easy chair at Buffalo Hill Terrace in Kalispell. Working through the Sons of Norway Fedraheimen Lodge No. 140, Nikolaisen and her friends sort, trim and weigh canceled stamps gathered from local businesses and individuals to send to a Norwegian institution called Tubfrim. The organization sells the stamps to collectors to raise money for tuberculosis research as well as to help disabled children. “The name Tubfrim is a combination of tub for tuberculosis and frim, part of the word for stamp in Norwegian,” Nikolaisen said. Back in 1928, a postmaster in Norway got the idea of collecting stamps as a painless way to raise money to eliminate TB in the country’s children. As fewer children suffered from TB, Tubfrim expanded to assist disabled children while still paying for research into tuberculosis, which still plagues Third World countries. “TB has hit South Africa really bad,” Nikolaisen said. Throughout Norway, private citizens along with embassies, consulates and Seamen’s Churches participate in the program. Outside the country, the United States makes the greatest contributions from people such as Nikolaisen participating through the Sons of Norway. She still recalls seeing the Tubfrim building while on a tour of Norway back in 1984. “They have the same building that was the hospital,” she said. She decided to get involved with Tubfrim about a year ago. Nikolaisen asked fellow Sons of Norway lodge members to save canceled stamps as well as businesses and government agencies that receive payments. “When I pay a bill, I put a stamp on it,” she said. Nikolaisen hopes to reach more businesses and people willing to save canceled stamps and drop them off at the front desk at Buffalo Hill Terrace. She said she can find a volunteer to pick up volumes of stamps from businesses. Those interested should cut off the corner of the envelope or postcard, making sure to leave room (1/2 inch) around the stamp and cancellation. If the letter or postcard is older than 50 years, don’t cut off the stamp. Contribute the envelope or postcard intact. Stamps with cancellations command the most money but lose their value if damaged. Even small defects, such not-intact perforation, render a stamp worthless to collectors. Although people use fewer stamps these days, collecting remains a huge hobby. “They’re begging for them all over the world,” Nikolaisen said. She understands the attraction after handling hundreds of brightly colored stamps. Themes run from presidents to birds to flowers to airplanes and come from countries all over the world. Nikolaisen received a collection of stamps that got stuck in a drawer and forgotten years ago. It included a 3-cent “Win the War “stamp with an airplane from World War II. Others brought more memories from times long past, like the 5-cent airmail stamp. “We don’t see that anymore,” she said. When people drop off stamps, Nikolaisen separates them into United States or international stamps. She has recruited people she calls “cut ups” to help trim them to Tubfrim standards. Using a scale and a basket, Nickolaisen and her assistants assemble 16-ounce plastic bags of stamps to then package for shipment to Tubfrim. Friends helping her with many aspects of the project include Millie Newgard, Trish Ingvalson and Lorraine Wagnild. Nikolaisen said every project benefits from getting more people involved. She includes those who decide to set aside envelopes with postage stamps. “It doesn’t cost a thing to save your stamps,” she said. This project provides a nice way for Nikolaisen to keep up her life of contribution in spite of a few new limitations. Because of some health issues, she said she decided recently that she wasn’t up to driving and gave up her car. Nikolaisen likes to quote a saying that continues to inspire her. “Don’t forget to do something even if you can’t do everything,” she said. Published: July 7, 2012, 4:55 a.m.